New Philippine Ambassador to Singapore Joseph Del Mar Yap arrived at Post on 5 January 2018 to formally assume his duty. He was accompanied by his wife, Madame Josephine Gotianun Yap. 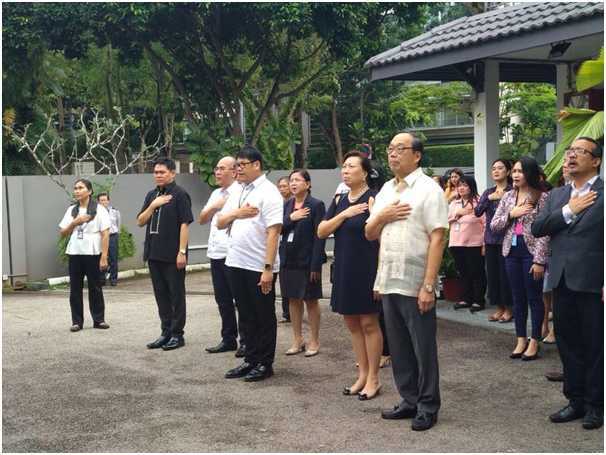 Immediately after their arrival, Ambassador and Madame Yap joined the officers, staff of the Embassy and the attached agencies for the flag retreat ceremony. A mass and simple salo-salo followed that enabled Ambassador Yap to get to know and interact with the Embassy team.